UPDATED: Sat., Feb. 4, 2017, 4:06 p.m.
LYON, France – Marine Le Pen, France’s far-right presidential candidate, unveiled her platform Saturday, envisioning a thriving nation “made in France,” with its citizens first in line for state services and the state unshackled by the rules-laden European Union. The French would guard their own borders, spend francs instead of euros and defend themselves under the National Front leader’s plans. Immigration, especially by Muslims, would be contained. A policy of “national priority” would give French citizens preference for public housing and other services over EU citizens and immigrants, and lower the profile of France’s large Muslim population. Le Pen hopes the British decision to exit the European Union and the election of U.S. President Donald Trump could provide a morale boost for right-wing, populist voters. “The entire world – it’s true for Brexit, it’s true for Mr. Trump – is becoming conscious of what we’ve been saying for years,” she said in a television interview. The timing could not be better for Le Pen, a leader in early polls for France’s two-round presidential election on April 23 and May 7, to roll out 144 nationalistic promises at a weekend conference. Le Pen speaks Sunday at the conference, but had plenty of supporters to speak for her on Saturday. “The survival of France is at stake. It’s the first time we’ve been so close to the goal,” National Front official Jean-Lin Lacapelle said. Unlike Trump, Le Pen isn’t a new quantity in French politics – she has headed the National Front since 2011 and came in third in the presidential vote in 2012. But they share a belief in what she calls “economic patriotism” and “intelligent protectionism.” Her plan includes reserving public bids for French companies if their offers are reasonable and adding a tax for foreign workers. Le Pen denounces what she calls the “ultra-liberal economic model” of globalization, open borders and “massive immigration,” notably of Muslims. In her view, immigrants take jobs from the French, raise the country’s terrorism risk and steal away France’s very identity. Among Le Pen’s “commitments” unveiled Saturday: No more membership in NATO’s integrated command. No more euro currency, European Union or open borders. And no more second chances for foreigners under surveillance as suspected potential terrorists – those thousands would be expelled. Early polls consistently show Le Pen among France’s two top presidential candidates, but suggest she’ll lose by a wide margin in the May 7 runoff. The candidate just two weeks ago considered the most likely to beat Le Pen and win, former conservative Prime Minister Francois Fillon, is bogged down in a corruption scandal over possibly fictitious parliamentary aide jobs for his wife and two children. Former budget minister Emmanuel Macron, who rebelled against the Socialist Party to strike out on his own, could end up facing Le Pen in the second-round vote. Macron, a centrist, also chose Lyon for a rally this weekend, as did leftist presidential candidate Jean-Luc Melenchon. Bruno Marcel, 52, who traveled to the southeastern city of Lyon from the Val d’Oise region north of Paris, predicted that Le Pen’s time has come. “All indicators are in place so that in May she is president of France,” he said. Still, the amphitheater at Lyon’s Congress Center was far from full. 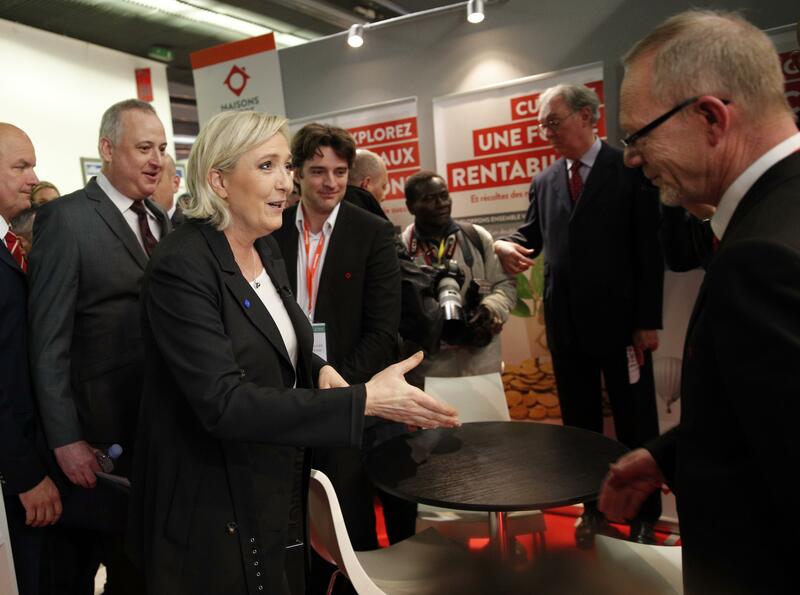 That was expected to change Sunday, when Marine Le Pen speaks. Le Pen’s first move, if elected, will be working to get France out of the 28-nation EU, and her first trip will be to Brussels to try to extract France from the euro currency, border agreements and other critical domains. It’s a battle she apparently thinks she might not win, so she has a Plan B: a Brexit-style exit referendum. France’s 10 percent jobless rate, growing disgust with politics as usual and the disarray of its political establishment both on the right and left have boosted the appeal of the National Front. Marine Le Pen has worked to shed the party’s image as a pariah for its racist, anti-Semitic profile under the leadership of her father, Jean-Marie Le Pen. Still, Le Pen knows that not all her measures please her supporters – including a decision not to seek a return of the death penalty, which was abolished in 1981. She has made it clear, however, that the platform is hers alone – not the party’s. Published: Feb. 4, 2017, 3:33 p.m. Updated: Feb. 4, 2017, 4:06 p.m.